The elliptical form and rolled edges of the Revival Suite create a look that is classically romantic. This extensive selection of fixtures, faucets and accessories provide different renditions of a 1920's Art Deco-inspired look. Purely traditional or eclectically modern, Revival is open to interpretation making it a versatile option for today's bathrooms. The Revival 6' BubbleMassage bath features a classic oval shape that embodies 1920s Art Deco design while its innovative technology creates a sensory sanctuary where you can relax, rejuvenate and renew. Experience BubbleMassage baths are designed to provide a complete and balanced air experience that is truly customizable. A variable-speed motor with an integral heater delivers a range of water treatments, from light bubbling to revitalizing massage, while 122 innovative airjets are precisely positioned to completely embrace you with bubbling water. Zones of Control at both ends and the midsection of the bath offer the ultimate in customization, allowing you complete control of the massage location. * 72" x 42" x 22"
The charming, traditional styling of this Portrait bidet integrates with the Portrait Suite to carry the understated elegance of French Provincial design throughout the room. The horizontal spray flows over the rim for localized cleansing of the body and aids in relief of certain health conditions. 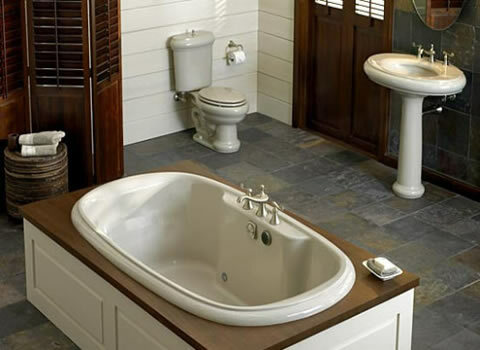 This bidet is available in a palette of Kohler colors to complement any decor. The Portrait suite epitomizes the understated sophistication of French Provincial design. Its distinctive, sculpted lines and soft edges are well-suited for traditional bath environments but also complement those that feature transitional design elements. 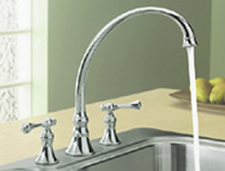 The Revival kitchen sink faucet features classic, timeless lines. The ergonomic, ADA-compliant scroll lever handles require only a quarter turn to turn the water on and off. The 12" swing spout and one-piece ceramic valve install on 8" centers. Solid brass construction ensures a long, reliable life for this faucet. Includes sidespray.